Many years ago (as in, more than 5), I tried to make pasta using a manual roller that my parents had sitting around. It was one of the first things "The Ukrainian" and I cooked together. While I don't have a picture of it handy, let's just say it was kind of thick. Whole wheat on your first attempt is not something I recommend. Years later, when we were registering for our wedding, the lady was pressuring us (as she is employed to do) to add more stuff to our relatively small registry. To satisfy her, we decided to register for a KitchenAid pasta roller to go with the KitchenAid mixer that we also added but did not think we'd get. Well, we ended up with both. I know that I don't use the KitchenAid mixer enough. I was using it to knead bread a lot until the smell of yeast started to get to me, and hot weather makes the thought of turning on the oven a terror. I had planned on using the roller on the Valentine's Day after we got married, as I was going to make ravioli and had the filling almost ready and everything... finding out later that "The Ukrainian" had made reservations someplace. In retrospect, I would have probably had a hard time using it for the first time myself. Ironically, the couple who gave us the roller was considering one of their own and wanted to play with ours, so we scrambled to get the house ready for a little pasta party of sorts. We used a simple recipe from Aida Mollenkamp, whose cookbook I mentioned in another post. "The Ukrainian" and I did most of the dough rolling/cutting, and my friends were on sauce duty. This worked out well, because the sauce was, well, awesome sauce *whomp whomp whomp* corny joke. I don't know how people do this solo, but I'm sure it comes with practice. Leftovers our friends took to go! Someone's plate. Pasta had a nice, wholesome, buttery taste to it. Best spaghetti I've ever had! Finally, I had picked up some cupcakes because it was almost my friend's birthday: dulce de leche, watermelon, pistachio, cookies and creme, black forest, and red velvet. I hadn't had cupcakes in a while, and these were pretty middle-of-the-pack... but visually fun! Much to my disbelief, I'm more or less at the halfway point of this pregnancy. Okay, so part of my disbelief is that I will have another 19-21 weeks of being in this state, but of course, I am celebrating this numerical milestone anyway. This is me at what was later declared 18 weeks and 4 days by a technician. Terrible selfie, I know, but I wasn't about to post the bare-belly photos that I've been bugging "The Ukrainian" to take every few weeks. At this point, the size of my stomach was largely (hah!) dependent on what I've eaten in the previous day (um, maybe a Pizookie and such) and this was definitely no exception. For kicks, this was taken about a week later. I have bad posture. Also, things really took off in the stomach department at this point, so I feel/am much more huge (huge-r?) now. Truthfully, we pretty much don't have anything ready yet, although there is kind of a rough plan of what we need to get and from where. I'm pretty sure we'll get going on that before the end of the month, though. I'm also pretty sure this is just one of those things that I will find overwhelming until I start, like packing for college, or planning a wedding. Speaking of overwhelming, we don't know what to name our baby. We agreed that we wouldn't even have a conversation about it until sometime in the third trimester, and even then, probably closer to the due date. Meanwhile, I think both of us are supposed to be independently brainstorming, but I secretly hope that "The Ukrainian" has picked magical names that I will instantly like so that the discussion can be over quickly. Of course, I am so picky about names even in my own "short-list" that I don't think that will be the case. I also somewhat worry that when I DO come up with some, he won't like them. 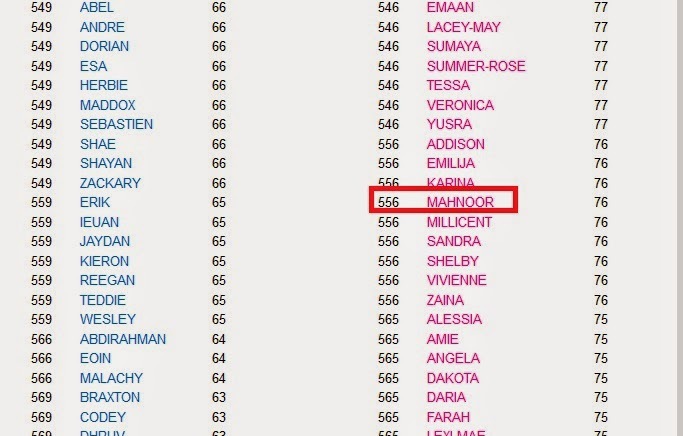 I was named after a teacher that my father had at the time, and my younger sisters were pretty much named after random people that happened to be present or on TV around the time they were born. Maybe the same thing will happen for us?? This is the busiest time of year at work for me, so I haven't been able to take time off besides for my prenatal appointments, which I already kind of feel bad about even though everyone is understanding. My provider doesn't have weekend appointments, but given that it gets me out of work, I don't mind! However, this HAS put a damper on our daycare search (childcare plans still up in the air). Like the medical offices, the darn places are only open on weekdays, so "The Ukrainian" and I are planning to take a "staycation" and look at local daycares, as early as I can take a day off for that. As for how I'm doing, well, I'm just happy to be not be nauseous all the time. I'm not really craving food or eating like a mad person like I thought I would. I haven't wanted sweets as much as I used to (wow! ), but I did learn that I can't eat too many of them after dinner like I used to, lest my already uncomfortable sleeping time be interrupted by sugar fits, which never happened before. I miss casual encounters with coffee, raw and smoked fish, and random egg or tuna salad sandwiches that are kind of questionable to have right now. Also, I'm definitely more relaxed that I can feel the baby move now and the tests have come back without any flags. As of this half-way point, I finally stopped riding the train into work. This was a decision that definitely will increase my transportation costs but one that "The Ukrainian" and I decided was best due to physical challenges and concerns about stress and immunity. I admit that after a year and a half of riding the train almost daily to work, I mentally celebrated on the last day when a series of issues made my 12-mile ride back lasted two hours. My stress levels have definitely evened out a bit. You're welcome, little baby. I realized I never had a chance to recap our recent trip to New York City, and in the spirit of LA beating NY in the Stanley Cup playoffs semi-recently (yep, I'm behind), here it is. 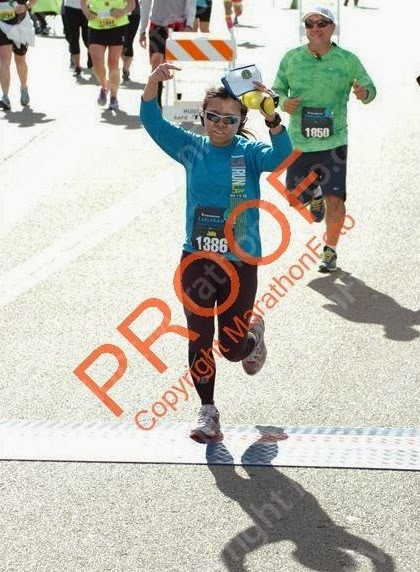 I was really happy to escape work because I haven't had much break in six months, and especially happy to remove myself from the summer-like heat we were having back at home. We took a red-eye and arrived before 5 AM New York time. I have done this before, and I really like how quickly you seem to arrive when you fly at that time. The chill in the air actually made me shiver, something that I haven't felt back at home since winter. We slogged our way to the Air Train and into the city, which took longer than it should have because it was Sunday, and subway service is slightly limited on those days. We had breakfast at a place called Veselka, a Ukrainian diner that I visited the last time I was in New York. The picture I have below is actually from last time, since I was too hungry to take my photography duties seriously. 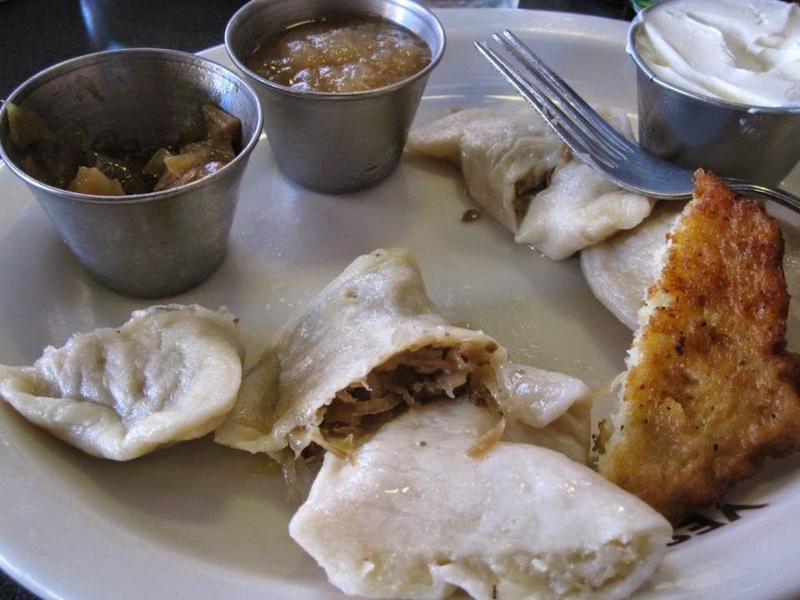 We shared these vareniki (pierogis basically, with a side of apple sauce, sour cream, and weird sauteed onions), a potato pancake, and an omelet for the protein. We walked around the Chinatown area nearby and then headed to the site of the World Trade Center. This is a site I have not had a chance to visit yet in my other trips to New York, and it felt so eerie to be walking around there. We spent some time sitting around the fountains, enjoying the view, people-watching, and thinking of how much transpired in this relatively small area. I'm pretty amazed that I didn't toss my cookies on the ferries. We also got to see Ellis Island in the process. We lucked out with great weather the entire trip, and it was cool to see such iconic landmarks in person. At this point, we returned to mid-city and tried to get lunch, but the place we planned was closed for renovations, and the place we ended up eating in its place was a HUGE whomp whomp (*ahem, Momofuku Noodle Bar*). We headed to Brooklyn, where our studio was. We rented from AirBnb, my first time using this service. The area was definitely eclectic, but ultimately, the whole rental experience was easy, cheap, clean, and safe, so this did work out for us. We slept for about an hour or two and headed out again to Times Square to visit all the usual spots like the Toys 'R Us and candy stores. 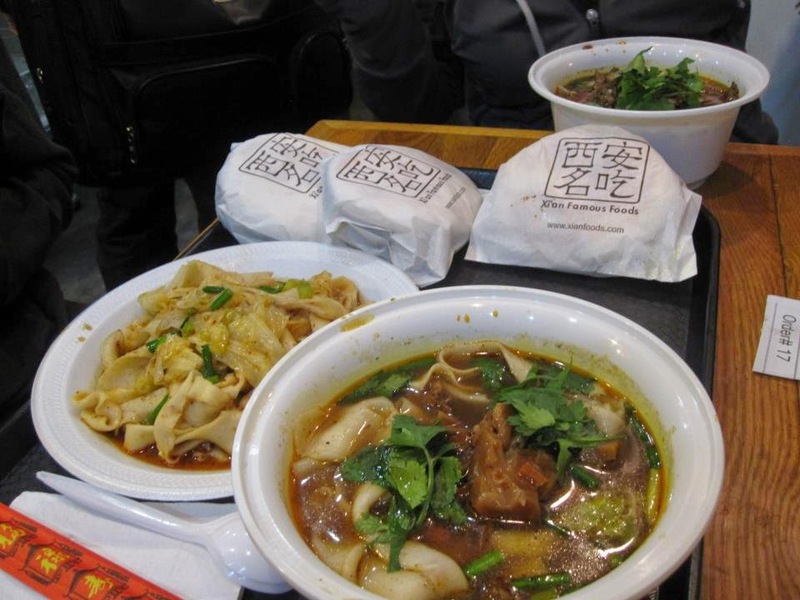 We were eating various things that night, most notably, I made a return trip to one of my favorite places ever, Xi'an Famous Foods. Unfortunately, in the rush of them closing, I'm not sure I ordered the right thing. Below is some of the food from the last time I was in New York, as it was way too dark to take a photo this time, relegated to some dark NYC street bench. I ordered a noodle bowl like the one below (top, when I should have ordered more like the bottom one), and it was so gross. It was way too oily, and I had to eat around lamb bits, which eeeew. Thank goodness we were sharing everything. The next morning, we headed to the Chelsea area, where they have a really nice market with lots of great food shops/restaurants and a renovated former railroad line that was converted into a park. It was a great place to walk in between food tasting. Me on the High Line, looking like I ate one too many things at Chelsea Market. One of the things that was eaten (not by me!). Gotta love my hand sanitizer reminder in the back. We ended the night in the Flatiron District to dine at Eataly, which is an Italian marketplace. I'm sorry I didn't take pictures here, but it was crowded and I was hanging on by a thread again energy-wise. I did have some really good pasta here, though -- tube pasta in a light tomato sauce. "The Ukrainian" had a wood-fired pizza. The next morning, we decided to head to Coney Island. It was a long, choppy ride, and I think I almost lost it by the time we got there. An orange-ade from Nathan's Famous saved my life. We then went to Wall Street, where I accidentally ran into this vegan food truck that I fell in love with the last time I was in New York, The Cinnamon Snail. Their donuts did not disappoint again, although the wait did. We then returned to Chinatown and ate ridiculously cheap dumplings in the hole-iest hole-in-the-wall ever and then to Little Italy where we took some cannolis to go. By this point of the trip, we were both growing weary and missed the relative cleanliness and tranquility of our home (HAHAHAHA), so we rested and spent the next day walking around Brooklyn and taking FOREVER for our flight to leave. All in all, we were happy to be back on this side of the country. I'm not sure how people live over there, as I complain about public transit enough without it being so central to life over here. I had a prenatal appointment the morning after I returned, and although I was sluggish as heck, the little one was very wiggly indeed. He or she must have enjoyed all the strange food raining down on it during our time away. I think it's safe to say that I'm done with traveling for now. That plane ride back was long enough for me to go internationally, and frankly, I am tired and find that the comforts of home are best. We may do something short and local before the baby comes, but even better, a "staycation" at home with everyone assuming we are at work would be amazing. A few years ago, I reviewed one of those "as-seen-on-TV things" and thought it'd be fun to give another popular item a spin. My favorite thus far is definitely the workout video category, but what about the fitness gadgets? I've seen The Flex Belt and the accompanying chiseled abs on TV way too many times, so my curiosity was peaked. The Flex Belt retails for around $199. It uses Electronic Muscle Stimulation to tone the abdominal muscles and has been cleared by the FDA. The contents of the box are a user guide, charger with the programming unit, the belt itself, a storage pouch for the belt, and a pack of gel pads. The gel pads need to be stuck onto the belt per the instructions, and when their stickiness wears off, they will need to be replaced for about $15 for a multi-pack. The gel pads. There is a non-stick cover that you peel off before use and replace after use. Now, I was told that typical results are evident in about a month or two, but after a couple of weeks of consistent use, "The Ukrainian" is helping me provide a review. He followed the first couple of weeks of the program suggested in the instructional manual, with recommended settings so you increase the intensity gradually. When the "program" is done, it will alert you with a beep, though the rest of the time it is quiet. "The Ukrainian" would usually be on his iPad while using this, so yes, it seems very convenient -- oh, and no sweating, either. I could also see an added benefit of not having to strain the neck and back, since you're not doing crunches on the floor. In short, he says that yes, you really can feel your ab muscles contracting from the stimulation. And no, I doesn't not hurt. Still, he recommends not doing this on a full stomach, just as you probably wouldn't do regular crunches on an empty stomach, either. After two weeks, he feels like his core is a lot stronger, which he notices particular while doing other activities like weight lifting, gardening, and running. From my vantage point, it's not like he suddenly got ripped, though he does appear to have firmed up a bit there already. As I've learned over the years, you can't spot-reduce fat, only dieting and cardio can help with that. But working on muscle mass and definition CAN help, and this is a pretty easy way of getting that started. FTC Disclaimer: I was sent a sample of The Flex Belt to try and was not otherwise compensated to provide a positive review. However, I did include affiliate links here. Half of 2014 is over! Is this even possible? I still remember writing this post and ducking out of New Year's Eve festivities as soon as possible because I was under the weather. I did not make resolutions, partly because even though we became homeowners, I had felt so down last year overall, so things could really only go up, right? Therefore, I'm not going to write about progress like I may have in the past. - Got a new nephew and niece! - Pretty much broke my iPhone downloading one of their updates -- one more month until I can get a new one! 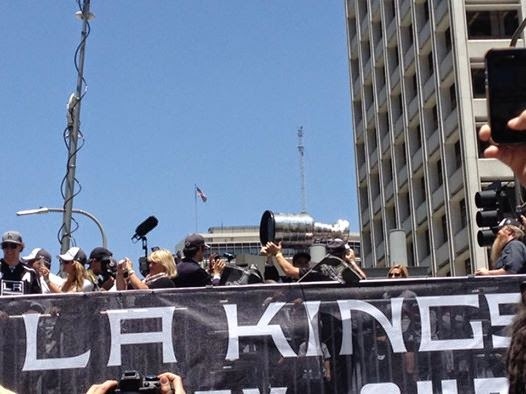 - The Kings won the Stanley Cup again, and I went to the victory parade! - Of course, the most prominent happening so far in 2014 is my pregnancy, and I am just so grateful for every moment and look forward to including the baby in my recap of the second half of the year! - Also, I must say that I'm pretty excited that we're going to see a live soccer game and concert of someone I've been a longtime fan of... soon.